In his nine symphonies, Gustav Mahler created an entire world for himself and his listeners. More than any other composer, he tries in his symphonic oeuvre to get to the very depths of the circle of life – the eternal cycle of growth and decay. What set of complete works would be more appropriate, therefore, for bringing the qualities and the unique sound of one of today’s leading orchestras to their fullest expression? 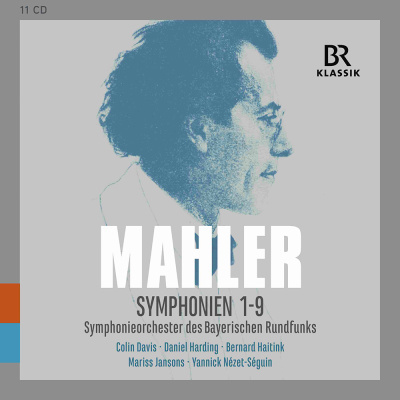 – In the 11-CD Mahler complete edition released by BR-KLASSIK, the Symphonieorchester des Bayerischen Rundfunks – under some of its most influential conductors, but above all its current chief conductor Mariss Jansons – tackles Gustav Mahler’s symphonic works. The performances were recorded live between 1996 and 2016 in the Philharmonie im Gasteig and the Herkulessaal of the Munich Residenz, and most of them are recent. Yannick Nézet-Séguin conducts Mahler’s Symphony No. 1, Mariss Janson conducts Symphonies Nos 2, 5, 7 and 9, Bernard Haitink Nos. 3 and 4, Daniel Harding No. 6 and Colin Davis no. 8, the “Symphony of a Thousand”. Numerous soloists and choirs are also featured. Since the era of its former chief conductor Rafael Kubelik, who founded the Symphonieorchester’s Mahler tradition during the early 1960s, these works, written on the threshold of the modern age, have been fixed items in the orchestra’s repertoire. – The recordings represent a challenging part of the recent repertoire of the Symphonieorchester des Bayerischen Rundfunks; under the baton of Mariss Jansons, and other conductors of the late 20th and early 21st century especially associated with it, this renowned orchestra, with the musical and interpretive mastery for which it is justly famed, provides truly memorable performances. These days, the Symphonieorchester des Bayerischen Rundfunks is probably one of the leading ensembles for conveying the special sound of Mahler’s music.